Following up on rumors in December that described "hard to solve" issues that Qualcomm was experiencing as it works to deliver its first mainstream 64-bit mobile chip, Bloomberg has now reported that Samsung "will use its own microprocessors in the next version of the Galaxy S smartphone." Citing "people with direct knowledge of the matter," the new report said Samsung tested Qualcomm's Snapdragon 810 but "decided not to use it." Both companies have declined to address the issue publicly. Two weeks ago, a research note by JP Morgan described the same overheating issue, explaining, "For the Snapdragon 810, a flagship chip for use in high-end models, we believe the issues are related to the implementation of new 64-bit ARM cores (A57), which is causing overheating when accelerating above 1.2-1.4 GHz frequencies, which is a major limitation for a flagship phone." Android phone makers have been chomping at the bit for an opportunity to deliver 64-bit processing to their customers ever since Apple released its A7-powered iPhone 5s in Q3 2013. Samsung initially promised investors that its next flagship phone would be 64-bit back in September 2013, but wasn't able to deliver when it released its Galaxy S5 last spring. It also failed to deliver a 64-bit version of its Note 4 last fall when that device was rushed to market to compete against Apple's own large screen iPhone 6 Plus, powered by Apple's second generation 64-bit A8 chip. Samsung's upcoming Galaxy S6 had been expected to finally achieve 64-bit processing via Qualcomm's Snapdragon 810, along with other Android flagship phones this spring including LG's G4 and HTC's One M9. Like Qualcomm, Samsung is also believed to be close to finishing its own 64-bit Application Processor; however, both companies are depending upon the same generic core designs developed by ARM, which specify multiple Cortex A53 and Cortex A57 cores paired in a "big.LITTLE" configuration to scale between performance and efficiency. Apple's custom A7, A8 and A8X 64-bit chips use a completely different architecture. If Qualcomm's overheating issues are indeed related to ARM's A57 core running at a high clock speed, Samsung may also be struggling to solve the problem, given that it is relying upon the same design in its initial 64-bit Exynos chips. Can Samsung ditch Qualcomm's baseband? Building a phone that can work on all existing CDMA and LTE networks globally has historically all but required a Baseband Processor from Qualcomm, which has broad ownership of key patents required to build functional devices. For example, Apple's iPhone models since the release of the 2011 Verizon iPhone 4 use Apple's own A4 to A8 Application Processors, but also incorporate a separate "MDM" Baseband Processor from Qualcomm. 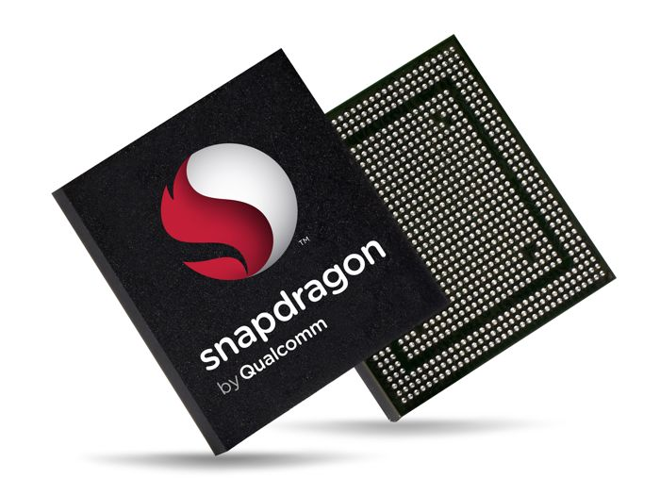 Rather than using its own Exynos chips paired with a Qualcomm MDM like Apple, Samsung has opted to use Qualcomm's integrated Snapdragon, which incorporates both the Application Processor that runs the phone and the chip maker's Baseband Processor that handles cellular networking. In markets where Qualcomm's baseband chips aren't required (or in its WiFi-only tablets), Samsung typically uses its own Exynos chips, although benchmarks indicate Samsung's own Exynos chips are significantly slower than Qualcomm's Snapdragon in both CPU and GPU operations (below). At the end of December, Samsung introduced a new version of its Galaxy Note 4 phablet powered by the company's own Exynos 5433 paired with a Samsung SS333 modem, supporting high speed LTE-Advanced cellular (albeit limited to data networks in the company's domestic Korean market). That chip also adopts the modern ARMv8 instruction set but remains a 32-bit processor. 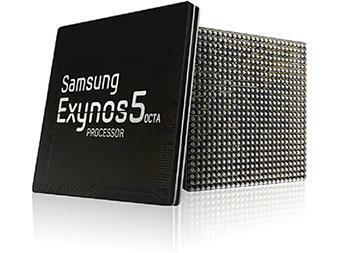 According to JP Morgan, only about 30 percent of Samsung's Galaxy S5 shipments used the company's own Exynos chips. However, Qualcomm's Snapdragon delays were said to be pushing Samsung to supply the majority of its next flagship's processors in-house. Samsung has been known to be working to deliver its own baseband technology to entirely remove its dependence upon Qualcomm in markets such as the US, Japan and China. However, if Bloomberg and earlier reports are correct, and Samsung actually replaces Qualcomm's chips with its own in its upcoming Galaxy S6 flagship worldwide, it will be a devastating blow to Qualcomm, which reportedly makes half of its revenues from the sales of Apple and Samsung devices. It could also be big problem for Samsung itself. In 2013, Samsung's few Galaxy S4 models that did ship with the company's own Exynos chips were plagued by serious design defects, highlighting why the company has counterintuitively continued to rely upon a direct competitor for the majority of its flagship phone processors. Apple is also understood to be developing its own baseband technology that could enable it to deliver new iPhone and cellular iPad models without requiring a separate Qualcomm MDM chip. So far, however, Apple has focused its chip design on developing the fastest 64-bit CPU cores and the most advanced mobile GPUs, enabling its latest A8 and A8X to beat mobile CPUs from Qualcomm, Samsung and Intel and to beat the best mobile GPUs including Nvidia's Tegra K1, Qualcomm's Adreno, and the ARM Mali graphics used by vendors including Samsung. Apple's 64-bit A7, A8 and A8X with advanced PowerVR 6 graphics from Imagination Technologies are not only beating out competing processors from Qualcomm and Samsung, but doing so at lower clock rates, less RAM and usually with fewer cores, leveraging custom-designed core optimizations that result in better performance with lower power consumption. Both Samsung and Qualcomm have been in the mobile processor business far longer than Apple, but after just five years of intense investment in building a silicon design team, Apple now has a vertically integrated supply of the world's most advanced mobile Application Processors. Apple's unique ability to sell large volumes of high end, premium devices has pushed rivals downmarket, which has subsequently eliminated alternative supplies for competitive, high end processors. After four generations of Tegra chip flops, Nvidia has exited the smartphone chip business; Texas Instruments similarly gave up on consumer versions of its OMAP line of ARM processors. If Samsung pulls the majority of its higher end chip business from Qualcomm, the company's Snapdragon line may be the next powerful ARM processor to go extinct, leaving Android with limited options outside of Intel's troubled Atom and a variety of lower end ARM chip designers such as MediaTek and Allwinner. That is likely to cause problems for lower volume, barely-profitable smartphone makers such as LG and HTC. Without Samsung, they don't collectively ship enough phones to finance the development of advanced, competitive Application Processors by Qualcomm.